On Thursday I’m heading over to the Wyss Institute for Biologically Inspired Engineering for a visit. The Wyss is a recent and unique model for a laboratory environment: where researchers, medical practitioners, and entrepreneurs come together to make “translational” technologies suitable for manufacturing. Not a lab for basic research, and not a business entity, the Institute functions in between those spaces. 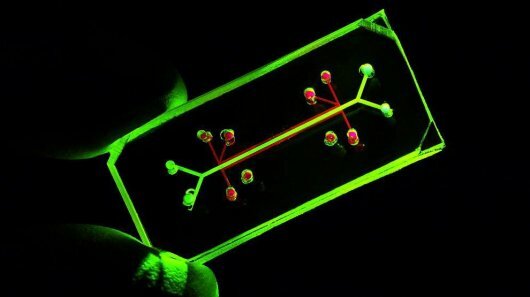 So much there to see and learn more about, but their lung-on-a-chip particularly caught my eye—a stylized and miniature version of the tree-and-branches shape of the human lung, with the living and active behavior of the flesh version all replicated. This looks like the next stage for pharmaceutical and therapeutics research, and it may well obviate the need for animal testing while achieving more accurate results. Cells normally exist in complex organ systems that are fed by blood vessels and affected by environmental changes, such as the expansion and contraction of lung tissues during inspiration and expiration. These conditions cannot be replicated in an ordinary Petri dish, so cells in culture do not behave as they would in the body, and cell-based research provides only limited information about the impact of a particular drug or toxin. To fill the gap, scientists normally rely on animal testing, but animal models are notoriously bad at predicting typical human responses to medications, and they are costly. The Biomimetic Microsystems team is addressing these shortcomings by replicating complex organ structures with patterns microetched into flexible biocompatible materials. These patterns can be shaped into channels containing blood capillaries that interface with neighboring epithelial tissues, like they do in living organs. These tissue-tissue interfaces distort and recoil elastically when stretched, and mimic other features of an organ’s normal microstructure. This approach enables Wyss Institute scientists to engineer model ‘organs-on-a-chip’ that mimic normal the complex interactions between living tissues within an organ, as well as the physical cues that cells normally experience in the body. These systems, developed with human cells, are intended to make drug development and toxicology screening more reliable, while obviating the need for animal testing. Similar systems are being developed as therapeutic devices, such as an artificial spleen used to clear blood of pathogens in patients with sepsis. This is just one of the ways the Institute is looking at research with an eye on bigger changes than the near-term. They’re creating research “cores that create cores”—mechanisms and methods that are multiply applicable in varying contexts, that alter the fundamental modes of investigation.